Personal protector against electromagnetic radiations. Just carry it on. It provides protection against electromagnetic radiation from wireless networks, computers, phone antennas, radard and so on. It doesnot protect from cell phone specific radiation when talking, as in this case the radiation emisor is too close to brain. Therefore, it is also recommended the use of Phione at the same time for cell phone waves specific protection. 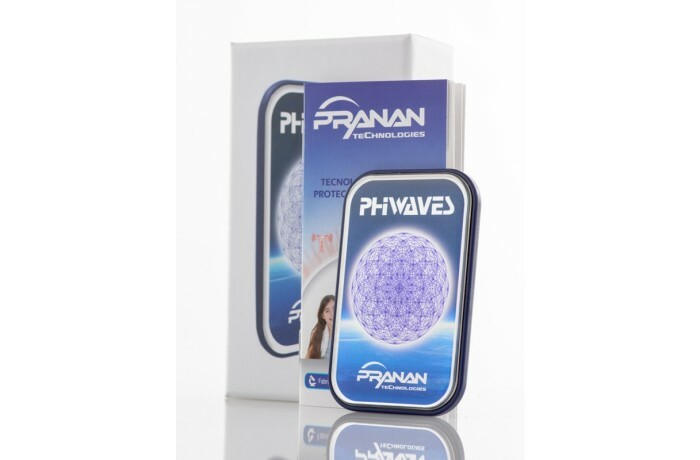 At night, if exposed to electromagnetic pollution (wireless networks…) Phiwaves is to be placed under the pillow or as close to the body. It is compatible with the rest of devices. It provides protection against electromagnetic radiations from wireless networks (wifi…), computers, microwave ovens, electrical wires, phone antennas, radard, satellites, scanners and so on. Also effective against geophaties caused by alterations in terrestrial electromagnetic fields. Unlimited duration, whenever internal structure is not destroyed. They are passive converters, they are not filters neither storage units. Just carry it on. Should there be any electromagnetic pollution in bedroom (wifi, electrical networks…) place it under pillow. Using it together with Relax, the protection and relax effects are highly multiplied. Phiwaves does not subtitute Phione, quite the opposite, they complememt each other. Cell mobile phone is used usually very close to the earing system and the brain sensors. So, specific protection against its radiation is absolutely necessary, placing Phione protector on back of the unit. That is Phione, doesnot substitute Phiwaves as its action range is specific to shield only from cell phones radiation. To obtain full preventive protection against mixture of both kinds of electromagnetic radiation, it is highly advisable the use both devices. Phiwaves action is better as close to body. Carried in trousers, shirt or jacket pockets as ideal locations. It can also be carried in wallets and handbags. Donot put it inside natural leather slips, handbags or leather wallets, as these could act as radiation shields limiting device performance. If by oversight Phiwaves is exposed to water (washing machine, pool,..) for a period of time, it will continue working correctly provided its internal structure is kept intact. Action range: 100 cm approx. Dimensions: 56 x 36 x 5.4 mm. Lifetime: Limitless, whenever kept in perfect use conditions.